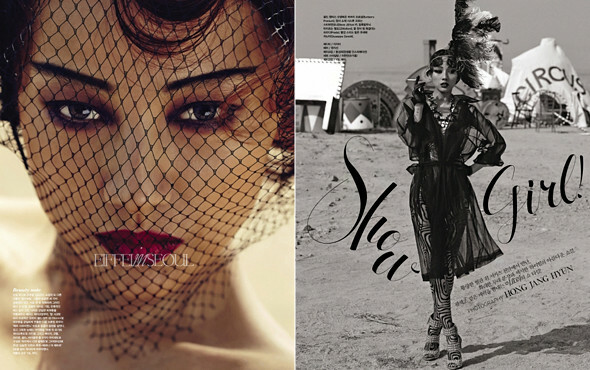 Lee Hyori (이효리) participated in a Great Gatsby-style editorial shoot with Hong Jang Hyun for May's issue of Vogue Korea. The 'Miss Korea' songstress was dressed to the nines for the editorial in garments from Burberry Prorsum, Chanel, Christian Dior, Dolce & Gabbana, Giuseppe Zanotti, Givenchy, Michael Kors, Miu Miu, Prada, Steve J & Yoni P, Tom Ford and more. Lee Hyori (이효리) will return with her highly anticipated fifth full-length album on May 21, 2013. Stop coming back to haunt me.